I doubt that Giotto, Bellini, Vermeer or Jacques Louis David, each in his own way an innovator, cared much one way or the other if those who viewed their work had anything like an instructed interest in the techniques and technicalities of painting. Up to the end of the 19th century (and I am speaking here purely about the Western tradition) technique, the intellectual processes that guided hand and eye in the execution of a painting, was the reserved interest of the painter himself and of an instructed minority of connoisseurs. The point, if I may put it somewhat simply, was to please the patron and give pleasure to the accidental viewer in the end result, the trophy object. If, as in the case of David for instance, the iconographic choices lent themselves to a political proposition, that was still an outer-directed result of a venture begun in an inward impulse that remained private to the painter and to an instructed few. With Fauvism, Cubism, the Blaue Reiter school and a host of other early 20th century movements there came a decisive shift; the pleasure we are meant to take from painting, in painting, was to incorporate an instructed pleasure not just in the what (the finished product) but in the how of painting. After this rupture, in order to extract the full aesthetic value from the encounter with a painting, the viewer can no longer be content with the passive, more or less instructed, absorption of the work presented to sight. The viewer now is expected to engage with the mental, intuitive and intellectual struggles of the painter as she or he engages with the process of painting. Put another way, the painting on the wall ceases to be an object, becomes instead a nexus in a process that never stops fl owing, backwards and forwards in time. The analogy, however partial, is with a freezeframe for a movie without beginning or end. I can put this another way: the painting now is not in even a partial sense a painting of something else, a re-presentation; the painting is a thing in itself, its outward-directed references part of its constitution, but its inwardness equally an intrinsic element in its meaning. The balance is held only if and when we consent to view the painting as a thing in itself, sufficient to itself and to its moment. This led to a view that the painting, to co-opt a phrase from Wittgenstein, is all that is the case, self contained in a space where time has stopped. But there is another way of looking at painting after this moment, that is, to see the painting as a point of arrival in a process — a point of arrival and also a departure. 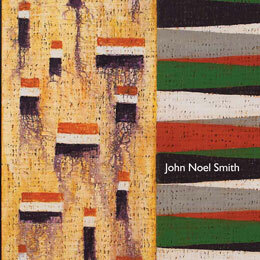 In John Noel Smith’s paintings, the two dimensions of the canvas must sustain themselves in an avowedly three-dimensional space, in the fourth dimension of time, and in the fifth dimension, neither space nor time, that is the domain of thought. There is something heroic about Smith’s work that I find extraordinarily attractive. He is completely immersed in paint and painting, for one thing; he doggedly refuses, with very rare exceptions, to make paintings of anything, as we might ordinarily understand that term. A spare, even terse, handful of motifs, marks, call them what you will, recurs over and over in his work — short lines, blocks of lines imitating cross-hatch, small and large blocks of saturated colour, usually in chain association, fields of mixed colour punctuated by emphatic dabs with a medium-sized brush — and he works in series, each series it seems to me a fresh return to, and then a departure from, what may have seemed exhausted in the previous series. The brush marks neither hide nor draw attention to themselves, and yet every mark, every passage of painting, speaks quietly but emphatically of the human hand and heart and mind that made this thing you are looking at. Smith politely sidesteps the egoistic bravura of Abstract Expressionism, with its slightly queasy emphasis on the artist as culture hero, in favour of a different kind of presence in the work. Time spent with one of these paintings evokes a curious kind of mimetic impulse; I find myself wanting to be that man with the brush in his hand, making this very painting, like that character in Borges who aspires to write the Quixote. I want to have in my self the exact sense of time passing, the exact conversation with materiality, with paint and history and the passing moment, that the artist was having while making this work. It’s an uncanny seduction, made possible, perhaps inevitable, because Smith is clearly in love with paint, the materiality of it, the plastic and viscous and redolent and exciting fact of paint itself. Something of this love of paint for its own sake ensnares the viewer, and through this portal we step inside Smith’s ongoing battle with lucidity. There are, it seems to me, two distinct impulses in his work: one drive is towards dominance, where the very achievement of the work, as a singleton or in a series, is that it is complete in itself, presents itself as a resonating presence that is forever tied to its own ground. The second impulse, the one he seems to be following at present, is to set up a series of oppositions or counterposed forces — form and colour, weight and a certain tendency towards floating, the scraped-back ground and the gestural brushmark — inside the temporary field that happens to be the given canvas. In the former case, the viewer tends to pursue a kind of achievable satisfaction, the satisfaction perhaps of having worked out what it is the painter was hoping the work might achieve. In the second case, where the vagaries of time are more in play, we are encouraged to fi nd in the painting not so much a resolution as a respite, a temporary but very satisfying island on which to rest before plunging on into the torrent of being and becoming. An example of this first tendency: Knots, green (1997), oil on canvas, 240 x 230 cm; of the second, Pandect II (2009), oil on canvas, 120 x 240 cm from the Pandect series. Whichever force is dominant in the work at a given time, one of the constants is the reassuring sense, to be gained from expending time in the presence of the work, that there is a cool intelligence, a presence in thought, governing what is being done here. And one thing more: to immerse yourself in time, the fourth dimension, is to be offered the opportunity of co-habiting with the painter in the fifth dimension, the dimension of thought. I have the strongest sense, spending time with these paintings, that whatever is prompted to my thinking self by the experience is congruent with what comes to thought for the painter as he works through the act of painting towards, not the finished so much as the sufficient work —that place where the work singing itself in colour and form, and the worker singing the act of making, are one and the same event. John Noel Smith – The Fold. Dublin: Hillsboro Fine Art, 2011.